- Easy to use. No other buttons to be operated except the power on/off switch, which requires least operation training. - Lightest door lift design brings lower labor intensity. - Electromechanical control system will lower maintenance cost. - Built-in rinse pump assure sanitizing rinse independent of actual water pressure. - Patented anti-clog Nozzle Fan wash nozzles can raise water efficeny. - LED wash and rinse temperature display make it easy to monitor. - Large wash tank will minimize the refilling request. - Tank heater with safety protection avoids dry heating risk and reduces parts damage. - Booster tank with high quality heat presevation material reduces heat loss. - The large 2-piece stainless steel plate filter can be taken out with ease. - Completely moulded wash tank is made out of one piece without edges annd corners. 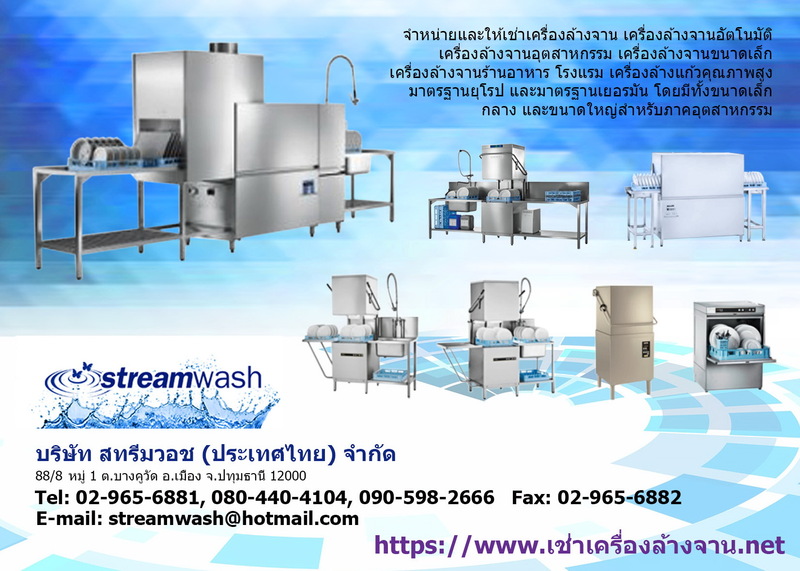 - There s no pipes and additional parts in the wash chamber, which ensure the hygiene. - All the key components can be maintained in the front of the machine. สามารถล้างจานได้ 3,000 – 4,000 ใบ/ชม. The entry level model of the PT Series the PT-500 pass-through dishwasher offers reliability and impressive cleaning results. Elliptical wash fields ensure optimal surface coverage. In addition, an efficient quadruple filtration with mediamat guarantees good results. A control panel with LCD display enables simple operation. According to the degree of soiling, one of three wash programmes can be chosen. Active energy management guarantees rapid heating and short wash cycles. The PT-500 is a reliable solution for your kitchen and deliviers convincing cleaning results. P50 Pass-through diswasher. High Performance to the core. The Value Line P50 delivers excellent cleaning results quickly and effectively. The pass-through warewasher of the Winterhalter ValueLine is easy to operate and user can trust in its level of efficiency, hygiene and reliability. This makes the P50 extremely attractive for professionals in search of an economical and practical solution for their growing warewashing needs. • ACTIVE model with Guaranteed Rinse System. Atmospheric boiler in ACTIVE model combine with rinse booster pump offer a perfect rinsing performance in term of constant pressure and high temperature of the water, always at 84°C during the rinse cycle regardless of the inlet water temperature (from 10°C to 60°C) and water pressure of the net work (a minimum of 0.5bar or 7psi). • The green eye of Guaranteed Rinse System (GRS) provides the operator with an immediate signal after every rinse cycle informing that rinsing has been performedto perfection. • High efficiency air gap (class A) in water inlet circuit to avoid water being siphoned back into the network as a result of a sudden drop in main pressures. • 4 second (variable) pause after washing and before rinsing ensures that no drops of unclean water will fall on the clean items at the end of the rinsing cycle. • Thermal label compliant approved and compliant with NSF sanitization standards (paragraph 7.1). • An effective rinse system uses only 3 litres of clean hot water per basket for lower running costs. • Incorporated Soft Start feature to offer additional protection to more delicate items. • Maximum capacity of 47 racks per hour (Thermal label complaint mode) or 67 racks per hour (High Productivity mode). • 77/90/150 seconds Thermal label complaint cycle. • 54/90/150 seconds "high productivity" cycle. • Automatic start on hood closure. • Open hood on the back side to prevent steam blasts to theoperator. • Fully automatic self-cleaning cycle avoids the risk of bacteria proliferation. • Self-draining wash pump and boiler. • Simple control panel with digital thermometers indicates wash/rinse temperatures. • Pre-arrangement for HACCP system implementation and Energy Management device. • Pre-arranged to accept external dispensers. • Three phase electrical connection, convertible to single phase on-site. • IPX 4 water protection. • Suitable to be connected to specific pre-wash tabling, service entry and exit tabling and roller conveyor tabling –included in Electrolux Professional Handling System range. MTF multi-tank flight-type dishwasher. Large scale efficiency and hygiene. The MTF series provides a high performance washing system that delivers hygienically clean wash results for canteens, hospitals and large catering operations. Depending on the wash items and available space, the machine can be modually configured. A well engineered concept with swivel doors and an automatic self cleaning system guarantees maximum hygiene. Thanks to minimum water consumption and item activated control zones, the MTF works extremely economically and keeps your operating costs low. Conveyor Dishwasher The PROFI-line – everything a professional operator needs. The successful product series from HOBART can be found working wherever the highest standards of cleanliness are required. It combines an efficient rinsing technique with ultimate user-friendliness and low operating costs. Numerous equipment options make PROFI-line a perfectly suited ware washing solution to suit any operation. STR 208 single-tank rack conveyor machine. Higher rack performance thanks to pre-cleaning. The STR 208 single-tank rack conveyor dishwasher, with pre-cleaning zone offers, increased capacity of up to 208 racks per hour. Multi-tank rack conveyor machines Large scale efficiency and hygiene. The MTR series ensures a high rack yield for hotels and foodservice environments whilst guaranteeing hygiene and perfect wash results. Depending on the wash items and the space available, the machine can be configured in a modular manner. The continual rack conveyor system provides an even transport speed for the items to be washed. This ensures hygienic cleaning. The optimised rinse system with minimal water consumption and the rack activated control zones also ensure economical consumption and low operating costs.